Review our collection of Bible Easter story coloring page sheets. These coloring pages are gathered together by Bible Story to help you find what you are looking for easily and quickly. 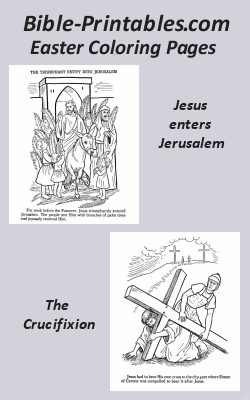 Printable Bible Eastert Coloring and Activity Pages are fun to use in Sunday School Classes and Vacation Bible School and make teaching lessons fun and easy! Printable Bible Coloring and Activity Pages are fun to use in Sunday School Classes and Vacation Bible School and make teaching lessons fun and easy!